Dissipative solitons for bistable delayed-feedback systems. ified in a virtual space-time representation of the equations with delay, and we find that conditions for their appearance are bistability of a nonlinear function and negative character of the delayed feedback. Both dark and bright solitons are identified in numerical simulations and physical electronic experiment, showing an excellent qualitative correspondence and proving thereby the robustness of the phenomenon. 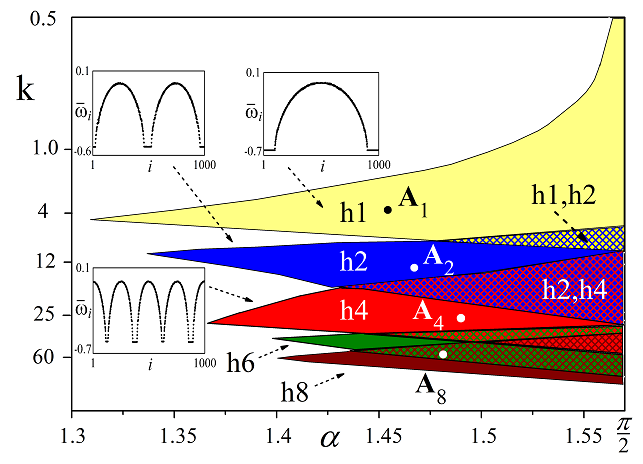 Along with single spiking solitons, a variety of compound soliton-based structures is obtained in a wide parameter region on the route from the regular dynamics (two quiescent states) to developed spatiotemporal chaos. The number of coexisting soliton-based states is fast growing with delay, which can open new perspectives in the context of information storage. Solitons are solitary waves or wave packets travelling in space. These structures, first reported by J. Russel in 1834, can be found in many physical, biological, chemical, and other spatially-extended systems. One can distinguish solitons observed in conservative and dissipative systems. The second ones are called dissipative solitons. They are characterised by structural robustness and can persist for a long time of observation despite of dissipation due to the presence of a source of energy in an active propagation medium. Surprisingly, as it was found in the last decade, stable localized patterns topologically equivalent to dissipative solitons can arise in a virtual space of the purely temporal dynamics of systems with delay. In the current paper, we reveal the appearance of dissipative solitons in a bistable Ikeda-type system with delay. We report multiple coexistence of bright and dark solitons from just a single one to any number as allowed by the system size. The phenomenon is observed in a wide parameter region at the transition from quiescence to developed spatiotemporal chaos in an excellent qualitative correspondence between numerical simulation and experiment. 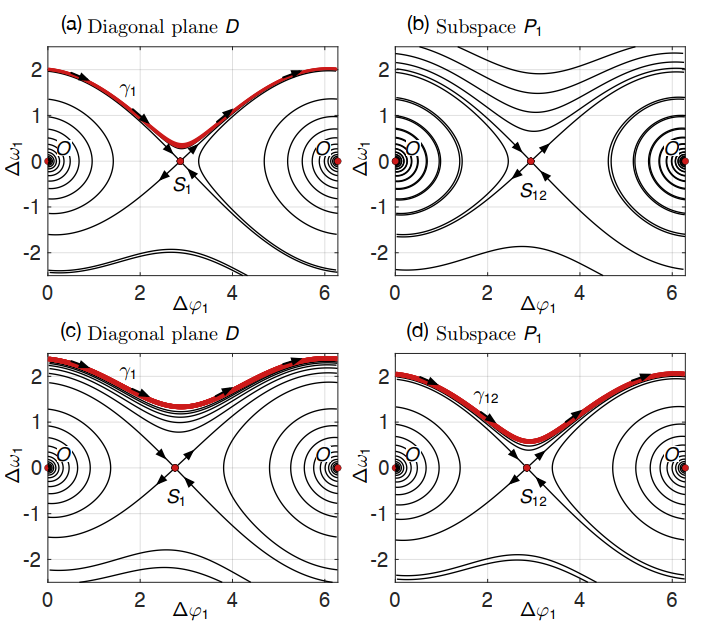 Two-dimensional spatiotemporal complexity in dual-delayed nonlinear feedback systems: Chimeras and dissipative solitons. We demonstrate for a photonic nonlinear system that two highly asymmetric feedback delays can induce a variety of emergent patterns which are highly robust during the system’s global evolution. Explicitly, two-dimensional chimeras and dissipative solitons become visible upon a space-time transformation. Switching between chimeras and dissipative solitons requires only adjusting two system parameters, demonstrating self-organization exclusively based on the system’s dynamical properties. Experiments were performed using a tunable semiconductor laser’s transmission through a Fabry-Pérot resonator resulting in an Airy function as nonlinearity. Resulting dynamics were bandpass filtered and propagated along two feedback paths whose time delays differ by two orders of magnitude. An excellent agreement between experimental results and the theoretical model given by modified Ikeda equations was achieved. Photonic delay systems are of astonishing diversity and have created a rich field of fundamental research and a wide range of applications. Under a transformation from time into pseudo-scape, their basic architecture makes them equivalent to ring networks with perfectly-symmetric coupling. For the first time we extend this spatiotemporal analogy in experiments by adding a second delay, 100 times the length of the first delay line. 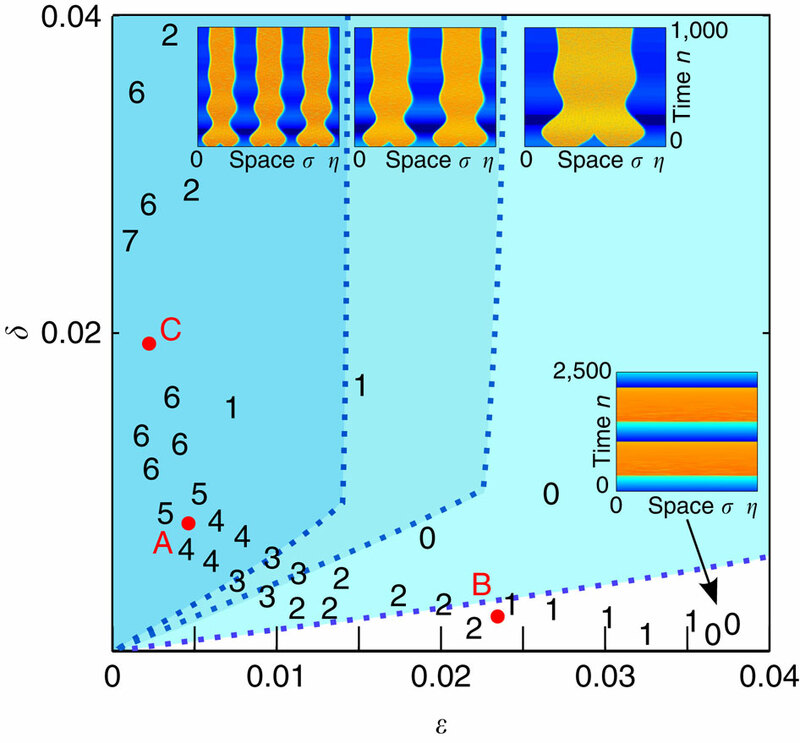 Nonlinearity is provided by a tunable semiconductor laser traversing a Fabry-Pérot resonator. Visualized in 2D-space, we show the temporal evolution of different chimeras and dissipative solitons. Experimental results excellently agree with numerical simulations of the double-delay bandpass Ikeda equation. Based on the attractors of multiple fixed-point solutions, we provide insight into the mechanism structuring the system’s dynamics. The synchronization of self-propelled particles (SPPs) is a fascinating instance of emergent behavior in living and manmade systems, such as colonies of bacteria, flocks of birds, robot ensembles, and many others. The recent discovery of chimera states in coupled oscillators opens up new perspectives and indicates that other emergent behaviors may exist for SPPs. Indeed, for a minimal extension of the classical Vicsek model we show the existence of chimera states for SPPs, i.e., one group of particles synchronizes while others wander aroundchaotically. Compared to chimeras in coupled oscillators where the site position is fixed, SPPs give rise to new distinctive forms of chimeric behavior. We emphasize that the found behavior is directly implied by the structure of the deterministic equation of motion and is not caused by exogenous stochastic excitation. In the scaling limit of infinitely many particles, we show that the chimeric state persists. Our findings provide the starting point forthe search or elicitation of chimeric states in real world SPP systems. We investigate the basin of attraction properties and its boundaries for chimera states in a circulant network of Hénon maps. It is known that coexisting basins of attraction lead to a hysteretic behaviour in the diagrams of the density of states as a function of a varying parameter. Chimera states, for which coherent and incoherent domains occur simultaneously, emerge as a consequence of the coexistence of basin of attractions for each state. Consequently, the distribution of chimera states can remain invariant by a parameter change, and it can also suffer subtle changes when one of the basins ceases to exist. A similar phenomenon is observed when perturbations are applied in the initial conditions. By means of the uncertainty exponent, we characterise the basin boundaries between the coherent and chimera states, and between the incoherent and chimera states. This way, we show that the density of chimera states can be not only moderately sensitive but also highly sensitive to initial conditions. This chimera’s dilemma is a consequence of the fractal and riddled nature of the basin boundaries. Solitary states for coupled oscillators. Networks of identical oscillators with inertia can display remarkable spatiotemporal patterns in which one or a few oscillators split off from the main synchronized cluster and oscillate with different averaged frequency. Such “solitary states” are impossible for the classical Kuramoto model with sinusoidal coupling. However, if inertia is introduced, these states represent a solid part of the system dynamics, where each solitary state is characterized by the number of isolated oscillators and their disposition in space. 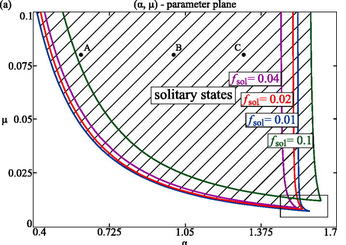 We present system parameter regions for the existence of solitary states in the case of local, non-local, and global network couplings and show that they preserve in both thermodynamic and conservative limits. We give evidence that solitary states arise in a homoclinic bifurcation of a saddle-type synchronized state and die eventually in a crisis bifurcation after essential variation of the parameters. Multiple scroll wave chimera states. We report the appearance of three-dimensional (3D) multiheaded chimera states that display cascades of self-organized spatiotemporal patterns of coexisting coherence and incoherence. We demonstrate that the number of incoherent chimera domains can grow additively under appropriate variations of the system parameters generating thereby head-adding cascades of the scroll wave chimeras. The phenomenon is derived for the Kuramoto model of N3 identical phase oscillators placed in the unit 3D cube with periodic boundary conditions, parameters being the coupling radius r and phase lag α. To obtain the multiheaded chimeras, we perform the so-called ‘cloning procedure’ as follows: choose a sample single-headed 3D chimera state, make appropriate scale transformation, and put some number of copies of them into the unit cube. After that, start numerical simulations with slightly perturbed initial conditions and continue them for a sufficiently long time to confirm or reject the state existence and stability. In this way it is found, that multiple scroll wave chimeras including those with incoherent rolls, Hopf links and trefoil knots admit this sort of multiheaded regeneration. On the other hand, multiple 3D chimeras without spiral rotations, like coherent and incoherent balls, tubes, crosses, and layers appear to be unstable and are destroyed rather fast even for arbitrarily small initial perturbations. Yuri Maistrenko, Serhiy Brezetsky, Patrycja Jaros, Roman Levchenko and Tomasz Kapitaniak. PHYSICAL REVIEW E 95, 010203(R) (2017). doi: 10.1103/PhysRevE.95.010203. 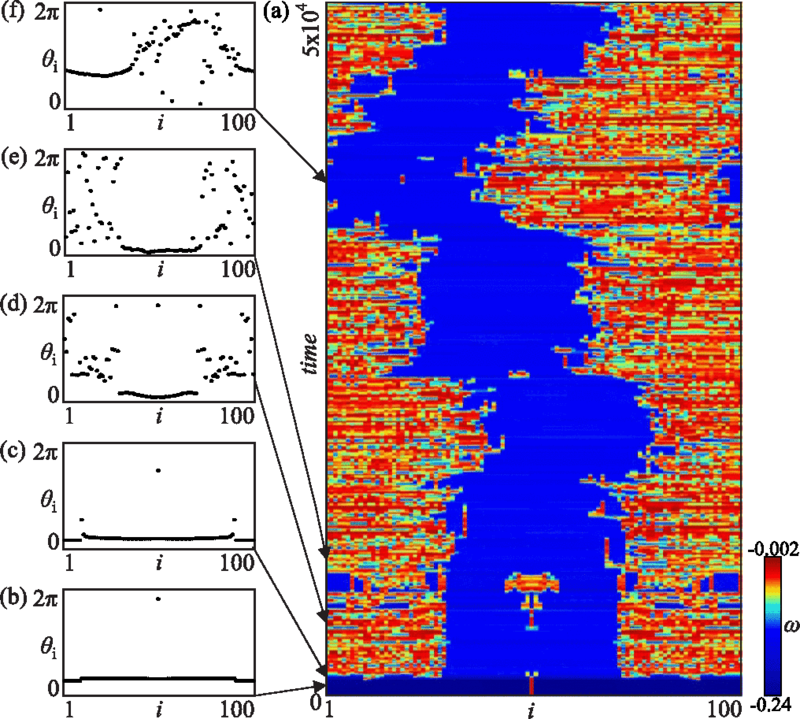 Chimera-like states generated by large perturbation of synchronous state of coupled metronomes. Chimera states in systems of coupled identical oscillators are spatiotemporal patterns in which different groups of oscillators can exhibit coexisting synchronous and incoherent behaviors despite homogeneous coupling. Here, considering the network of coupled pendula, we find that the patterns of chimera-like states can be generated after the large perturbation (in which one or a few oscillators have been stopped for the moment) of the synchronous state of the whole network. We show that these chimera-like states can be observed in simple experiments with mechanical oscillators, which are controlled by elementary dynamical equations given by classical mechanics. The smallest chimera state for coupled pendula. Wojewoda J, Czolczynski K, Maistrenko Y, Kapitaniak T.
Sci Rep. 2016 Oct 7;6:34329. doi: 10.1038/srep34329. Chimera states in the systems of coupled identical oscillators are spatiotemporal patterns in which different groups of oscillators can exhibit coexisting synchronous and incoherent behaviors despite homogeneous coupling. Although these states are typically observed in large ensembles of oscillators, recently it has been suggested that chimera states may occur in the systems with small numbers of oscillators. 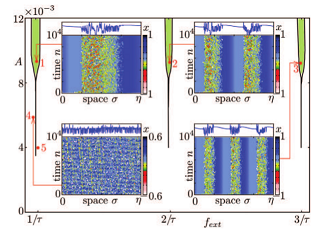 Here, considering three coupled pendula showing chaotic behavior, we find the pattern of the smallest chimera state, which is characterized by the coexistence of two synchronized and one incoherent oscillator. We show that this chimera state can be observed in simple experiments with mechanical oscillators, which are controlled by elementary dynamical equations derived from Newton's laws. Our finding suggests that chimera states are observable in small networks relevant to various real-world systems. Occurrence and stability of chimera states in coupled externally excited oscillators. Dawid Dudkowski, Yuri Maistrenko and Tomasz Kapitaniak. We studied the phenomenon of chimera states in networks of non–locally coupled externally excited oscillators. Units of the considered networks are bi–stable, having two co–existing attractors of different types (chaotic and periodic). The occurrence of chimeras is discussed, and the influence of coupling radius and coupling strength on their co–existence is analyzed (including typical bifurcation scenarios). We present a statistical analysis and investigate sensitivity of the probability of observing chimeras to the initial conditions and parameter values. Due to the fact that each unit of the considered networks is individually excited, we study the influence of the excitation failure on stability of observed states. Typical transitions are shown, and changes in network's dynamics are discussed. We analyze systems of coupled van der Pol–Duffing oscillators and the Duffing ones. Described chimera states are robust as they are observed in the wide regions of parameter values, as well as in other networks of coupled forced oscillators. Experimental multistable states for small network of coupled pendula. Dawid Dudkowski, Juliusz Grabski, Jerzy Wojewoda, Przemyslaw Perlikowski, Yuri Maistrenko and Tomasz Kapitaniak. Chimera states are dynamical patterns emerging in populations of coupled identical oscillators where different groups of oscillators exhibit coexisting synchronous and incoherent behaviors despite homogeneous coupling. Although these states are typically observed in the large ensembles of oscillators, recently it has been shown that so-called weak chimera states may occur in the systems with small numbers of oscillators. 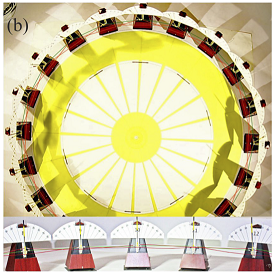 Here, we show that similar multistable states demonstrating partial frequency synchronization, can be observed in simple experiments with identical mechanical oscillators, namely pendula. The mathematical model of our experiment shows that the observed multistable states are controlled by elementary dynamical equations, derived from Newton’s laws that are ubiquitous in many physical and engineering systems. Our finding suggests that multistable chimera-like states are observable in small networks relevant to various real-world systems. A nonlinear oscillator model with negative time-delayed feedback is studied numerically under external deterministic and stochastic forcing. It is found that in the unforced system complex partial synchronization patterns like chimera states as well as salt-and-pepper–like solitary states arise on the route from regular dynamics to spatio-temporal chaos. The control of the dynamics by external periodic forcing is demonstrated by numerical simulations. It is shown that one-cluster and multi-cluster chimeras can be achieved by adjusting the external forcing frequency to appropriate resonance conditions. If a stochastic component is superimposed to the deterministic external forcing, chimera states can be induced in a way similar to stochastic resonance, they appear, therefore, in regimes where they do not exist without noise. The chimera state is a recently discovered dynamical phenomenon in arrays of nonlocally coupled oscillators, that displays a self-organized spatial pattern of coexisting coherence and incoherence. In this paper, the first evidence of three-dimensional chimera states is reported for the Kuramoto model of phase oscillators in 3D grid topology with periodic boundary conditions. Systematic analysis of the dependence of the spatiotemporal dynamics on the range and strength of coupling shows that there are two principal classes of the chimera patterns which exist in large domains of the parameter space: (I) oscillating and (II) spirally rotating. 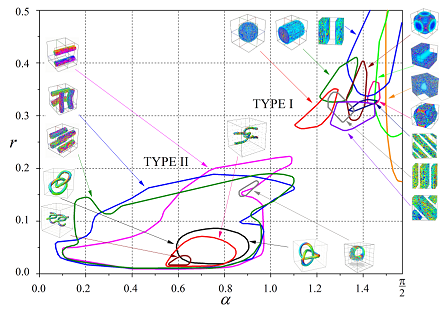 Characteristic examples from the first class include coherent as well as incoherent balls, tubes, crosses, and layers in incoherent or coherent surrounding; the second class includes scroll waves with incoherent, randomized rolls of different modality and dynamics. Numerical simulations started from various initial conditions indicate that the states are stable over the integration time. Videos of the dynamics of the chimera states are presented in supplementary material. It is concluded that three-dimensional chimera states, which are novel spatiotemporal patterns involving the coexistence of coherent and incoherent domains, can represent one of the inherent features of nature. Chimera is a rich and fascinating class of self-organized solutions developed in high dimensional networks having non-local and symmetry breaking coupling features. Its accurate understanding is expected to bring important insight in many phenomena observed in complex spatio-temporal dynamics, from living systems, brain operation principles, and even turbulence in hydrodynamics. In this article we report on a powerful and highly controllable experiment based on optoelectronic delayed feedback applied to a wavelength tunable semiconductor laser, with which a wide variety of Chimera patterns can be accurately investigated and interpreted. We uncover a cascade of higher order Chimeras as a pattern transition from N to N-1 clusters of chaoticity. Finally, we follow visually, as the gain increases, how Chimera is gradually destroyed on the way to apparent turbulence-like system behaviour. 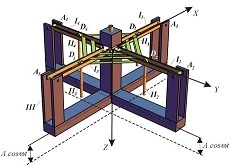 Dudkowski D, Maistrenko Yu., and Kapitaniak T.
Physical Review E 90, 032920 (2014). 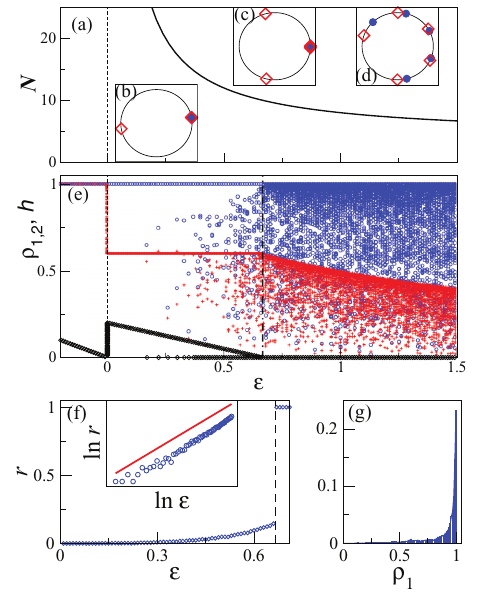 We discuss the occurrence of chimera states in networks of nonlocally coupled bistable oscillators, in which individual subsystems are characterized by the coexistence of regular (a fixed point or a limit cycle) and chaotic attractors. By analyzing the dependence of the network dynamics on the range and strength of coupling, we identify parameter regions for various chimera states, which are characterized by different types of chaotic behavior at the incoherent interval. 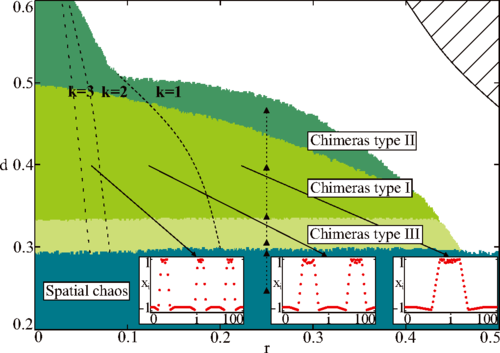 Besides previously observed chimeras with space-temporal and spatial chaos in the incoherent intervals we observe another type of chimera state in which the incoherent interval is characterized by a central interval with standard space-temporal chaos and two narrow side intervals with spatial chaos. Our findings for the maps as well as for time-continuous van der Pol–Duffing’s oscillators reveal that this type of chimera states represents characteristic spatiotemporal patterns at the transition from coherence to incoherence. Kapitaniak T., Kuzma P., Wojewoda J., Czolczynski K., and Maistrenko Yu. The phenomenon of chimera states in the systems of coupled, identical oscillators has attracted a great deal of recent theoretical and experimental interest. In such a state, different groups of oscillators can exhibit coexisting synchronous and incoherent behaviors despite homogeneous coupling. Here, considering the coupled pendula, we find another pattern, the so-called imperfect chimera state, which is characterized by a certain number of oscillators which escape from the synchronized chimera’s cluster or behave differently than most of uncorrelated pendula. The escaped elements oscillate with different average frequencies (Poincare rotation number). We show that imperfect chimera can be realized in simple experiments with mechanical oscillators, namely Huygens clock. The mathematical model of our experiment shows that the observed chimera states are controlled by elementary dynamical equations derived from Newton’s laws that are ubiquitous in many physical and engineering systems. 3) via homoclinic transition with complex multistable dynamics including an "eight-like" limit cycle resulting eventually in a chimera state. We discuss the desynchronization transition in networks of globally coupled identical oscillators with attractive and repulsive interactions. We show that, if attractive and repulsive groups act in antiphase or close to that, a solitary state emerges with a single repulsive oscillator split up from the others fully synchronized. With further increase of the repulsing strength, the synchronized cluster becomes fuzzy and the dynamics is given by a variety of stationary states with zero common forcing. Intriguingly, solitary states represent the natural link between coherence and incoherence. The phenomenon is described analytically for phase oscillators with sine coupling and demonstrated numerically for more general amplitude models. to compare the phenomenon with laminar-turbulent patterns in fluid.